Members of African and UK civil society and communities sent a letter to the “Mining on Top Africa: London Summit” – a decisive conference on African mining for Europe that took place on June 24 and 25 – accentuating how the introduction of large-scale mining in Africa has made many communities to face displacement, poverty, illness, massive pollution, loss of fertile agricultural and ancestral land, destruction of livelihoods and culture. Further, the letter affirms that “Corporate Social Investment and Responsibility are purely ways to justify the companies’ social licence and bolster their image”, and highlights that London, where the event was carried out, is the leading global centre for mining finance, with billions of pounds of investment money flowing through it into destructive mining projects around the world. 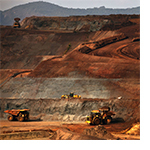 Further, African organizations and groups have shared various case studies to offer an insight into the many grave social and ecological issues caused by large-scale mining in this continent.